When the matter is in question, California procedure sets forth rules and requirements to follow in order to establish who are a child’s legal parents. Such matters are known as “parentage cases,” or “paternity cases” where the court issues orders that identify the child’s legal parents. There are many important reasons to establish parentage for a child. From a legal standpoint, parentage affords the child the same rights and privileges as those of a child whose parents are married. Some of these privileges and rights include: 1) legal documentation identifying both parents; 2) financial support from both parents; 3) access to family medical records and history; 4) having both parents’ names on the child’s birth certificate; 5) health insurance coverage from either parent; 6) the right to inherit from either; and 7) the right to receive social security and veteran’s benefits, when available. Under the law, as soon as parentage is established, the court will have the authority make orders for child support, health insurance, child custody, visitation, name change, and reimbursement of pregnancy and birth expenses. Proponents of the new law argue that it places the interests of children first and that judges will not be restricted to rule in ways that could negatively impact a child. Child custody matters are full of complicated details. Bringing any related action in a San Diego court requires full knowledge of the local court rules and procedures. Parents with questions about child custody matters are encouraged to contact Doppelt and Forney, APLC . Mr. Doppelt is a knowledgeable family law attorney with more than 20 years of experience representing parents in Southern California. Doppelt and Forney, APLC serves clients in Linda Vista, Encinitas, Scripps Ranch, San Diego, and throughout Southern California. 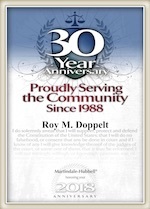 For a consultation with a dedicated family lawyer, contact Doppelt and Forney, APLC through the law firm’s website or give us a call toll-free at (800) ROY IS IT (769-4748).